Massimo Faggioli is professor of theology and religious studies at Villanova University and a contributing editor for Commonweal. Among his books with Liturgical Press are True Reform: Liturgy and Ecclesiology in Sacrosanctum Concilium (2012); Pope John XXIII: The Medicine of Mercy (2014); and Sorting Out Catholicism: A Brief History of the New Ecclesial Movements (2014). "Catholicism and Citizenship is excellent historiography, a synthetic scholarly survey of historians' findings and theologians' insights. All readers will find in its voluminous notes other books they would like to read; doctoral students will discover dozens of dissertation topics to explore; and scholars, arguments to pursue. General readers will meet provocative, new perspectives on the history and reality of the church in our time. All in all, a genuinely rich read." "Faggioli has given us a very thoughtful short volume that would provide an excellent text for university and theological school courses and selective parish adult discussion groups. I find his volume a gem." "Faggioli is the most articulate interpreter of American Catholicism today. 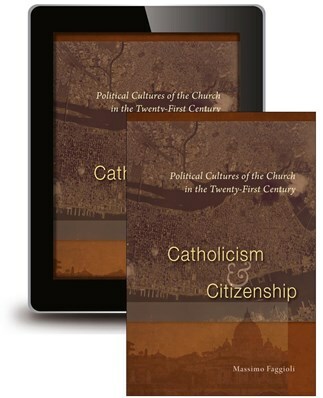 Catholicism and Citizenship is an instructive and sobering call to action." "The work conducted here is extraordinarily well informed and worthy of thorough engagement in the discussions surrounding Catholicism and public theology." "Faggioli's volume is a must read both for its layout of Vatican II's political ecclesiology and the effort to make it integral for contemporary Catholic consciousness, as well as for its further bibliographical suggestions."